Estate of the artist via Galeria Henze, Lugano. Ernst Ludwig Kirchner: Paintings, Drawings, and Prints, National Gallery of Art, Washington, D.C., 1992. A Century of Drawing, National Gallery of Art, Washington, 2001-2002, no. 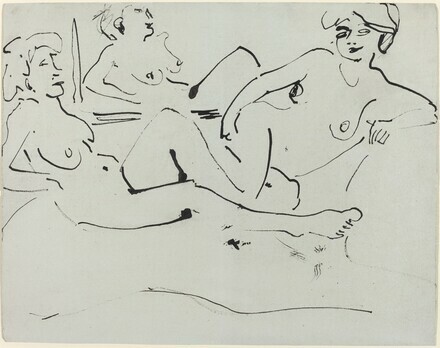 14, as Two Women Reclining before a Mirror. Ernst Ludwig Kirchner, 1880-1938, National Gallery of Art, Washington, D.C., 2003, no. 14. Galerie Henze & R.N. Ketterer, ERNST LUDWIG KIRCHNER, Lugano: 1985, no.140. A Century of Drawing. Exh. cat. National Gallery of Art, Washington, 2001-2002: no. 14. Ernst Ludwig Kirchner, 1880-1938. Exh. cat. National Gallery of Art, Washington, D.C.; Royal Academy of Arts, London, 2003: 19, no. 14.